The EOTech G33 Red Dot Sight Magnifier is a fast and convenient way to get more range out of your professional-grade red dot sight. Known as the first choice of America's Elite Special Operation Forces, this Magnifier from EOTech uses powerful optics to enhance the magnification rate of your red dot of choice by 3x, greatly extending the range and accuracy of your firearm. The EOTech G33 Red Dot Sight 3x Magnifier features a new and improved mount over its predecessor, a Switch-to-Side (STS) mount that allows you to quickly engage and disengage the magnifier by flipping it to the side of your firearm. The EOTech G-33 3x Magnifier is shorter and lighter than its previous incarnation, the G23, and features a tool-free azimuth adjustment and an extremely wide field of view, allowing you to achieve improved magnification without compromising target acquisition. 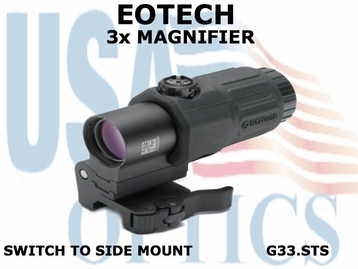 Magnify the potency of your holographic sight by augmenting it with the EOTech G33 Magnifier w/ Adjustable Diopter. » Eye Relief - 2.2"